Brussels' justice boss Viviane Reding was left feeling decidedly crumby on Monday during a visit to London, after thieves nicked her luggage from an official EU car. Among the items stolen was a cottage pie that the commissioner reportedly purchased from a farmers' market in Blighty's capital. Apparently, Reding is a fan of British cuisine and she bought the spuddy, cheesy, meaty grub favoured by belly-swingers across the nation to showcase our pies to doubters back home in Luxembourg. "I got it to show people how good British cooking is," she told London paper the Evening Standard . "I just hope that at least they eat it and don't throw it away." Prior to the robbery, the commissioner - who is currently witnessing her planned overhaul of data protection law in the 28-member states' bloc flake and wane with a soggy bottom in the EU pressure cooker - had tweeted her obsession with baked Brit goods. "Happy to be in London and not just for the scones," she merrily noted. 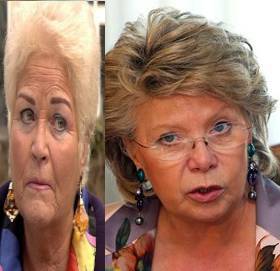 Were Pat Butcher and Viv Reding separated at birth? The thieves didn't just scarper with a cottage pie, however. Reding, known for wearing pie-catching, er, sorry, eye-catching, Pat Butcher-style earrings, also lost clothes, jewellery and make up. "It's the first time I have had my bag stolen and I travel all around the world. They left my papers fortunately. It is a real pain in the neck," the commissioner said. The Standard reported that Reding's car had been left unlocked in Albermarle Street, London, but that opportunist scoundrels had made off only with the EU vice president's personal goods. Official paperwork was left behind in a separate case in the vehicle, which prevented the commissioner from looking as red-faced as a rhubarb crumble had she been caught out in such a data protection gaffe.